Organic crop researchers are now focused on developing a larger, more diverse tool kit to control weeds. “The research has kind of evolved to the point where we’ve looked at things in isolation and now we’re looking at integrating a number of different factors,” Eric Johnson of the University of Saskatchewan’s agriculture college said during the Organic Connections Conference and Trade Show held in Saskatoon Nov. 1-3. Organic Connections was established in 2004 to organize conferences and trade shows biennially for the prairie organic industry. Johnson cited fellow researcher Steve Shirtliffe and his team at the U of S for breaking new ground on enhanced organic weed control using agronomic and mechanical methods. “I think Steve’s research has evolved to that point now where he’s really doing a lot of good work and putting systems together that will provide a high level of weed control in a number of organic crops,” he said. However, it remains unknown whether integrating different systems for larger organic or even conventional operations is doable any time soon. “There’s still a lot of technological things that might have to change in terms of equipment manufacturing and things like that for people to be able to cover a large acreage, so that’s probably the big challenge with it,” he said. Researchers looked at three types of mechanical weed control tools in peas and lentils: in-crop harrowing, in-crop rotary hoeing and inter-row tillage. The limitations were apparent when using only one mechanical weed control system. Rotary hoes don’t cause much crop damage but have a narrow weed stage window for when it can be used, which means weeds have to be very small. Weeds can be a little larger when In-crop harrowing, but the practice will damage crops if they get too advanced. Inter-row cultivation needs enough crop so that it isn’t buried, but the practice does not touch weeds in the row. “Basically what we found was that all of these by themselves had some effect, but when we combine two practices, (it) had the best results — the rotary hoeing and inter-row cultivation or harrowing and inter-row cultivation,” he said. Researchers also saw some additive benefits in terms of yield and weed control when using a higher seeding rate along with two mechanical weed control practices. Johnson said some farmers still think about seeding bushels per acre instead of seeds per metre. “A bushel is a measurement of volume and seed size can vary so much that if you have very large seed and you’re seeding a bushel per acre, you might not be getting enough plants. If you have very small seed, you might be seeding more than you need to,” he said. Using an example of 400 plants per sq. metre, he said producers need to first determine what their seed weight is and then calculate seeding rate in pounds per acre. An effective seeding rate also reduces weed biomass and increases yield. “With the higher seeding rates and two mechanical tillages, we increased seed yield by up to about 70 percent and reduced weed biomass by about 80 percent,” he said. Researchers achieved results similar to using herbicides. “If you reduce weeds by 80 percent with a herbicide, that’s considered control,” he said. However, Johnson said that all the methods he described are ineffective on perennial weeds such as Canada thistle, which are too deeply rooted for the harrows. 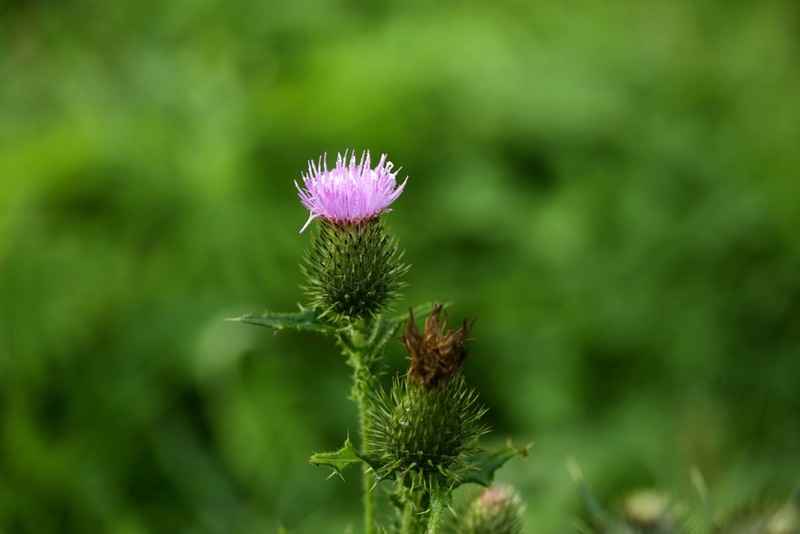 In an attempt to starve the root system, researchers are targeting Canada thistle using a clipping technique with a comb cut that involves several passes over the weed. He said the next research phase will look at controlling perennials. Copyright © 2019 by OrganicBiz. Theme: DW Focus by DesignWall.